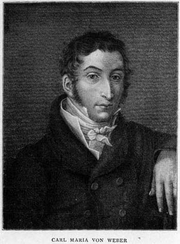 Carl Maria von Weber was born to an aristocratic family in Eutin in the province of Holstein, Germany. He became a composer and opera director during the years of transition from Classical to Romantic music. He is noted especially for his operas Der Freischütz (1821), Euryanthe (1823), and Oberon (1826). His 1819 piano piece Aufforderung zum Tanz (Invitation to the Dance), Op. 65, J. 260, was the first known concert waltz. It was extremely popular and became part of the repertoire of Franz Liszt, Frédéric Chopin, and others. It's probably best known today in its orchestration by Hector Berlioz and inspired Michel Fokine's 1911 ballet Le Spectre de la Rose. Carl Maria von Weber is currently considered a "single author." If one or more works are by a distinct, homonymous authors, go ahead and split the author. Carl Maria von Weber is composed of 11 names. You can examine and separate out names.